Perspectives on integrating governance, risk, and compliance. organization. We call that integrated approach “GRC”. 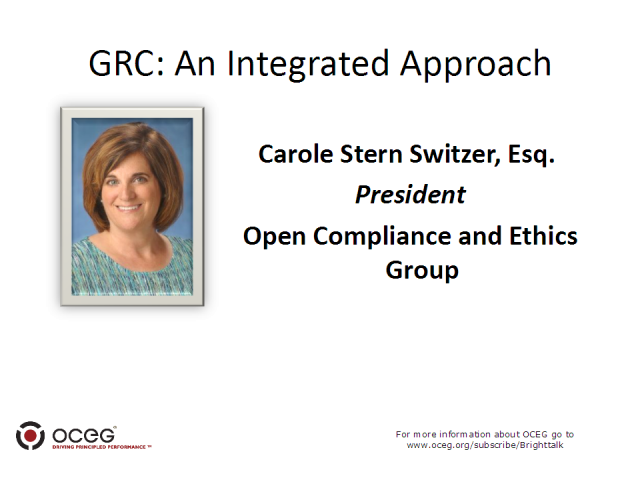 Come hear OCEG President Carole Switzer discuss this important topic. The current economic climate cries out for technology standards at the core of information management. This round of financial losses are the result of weak governance and risk management failure. We’ve seen such tragedy before and we are in danger of repeating these mistakes. The time has come for the methods that help manage risks and enforce corporate policies to exploit a common software language (XML). In these challenging times, the critical work on common risk and compliance definitions for software is poised to bear fruit. This session will focus on the progress in XML for Governance, Risk and Compliance management and its potential for lowering costs and increasing process efficiency in every organization.